Product prices and availability are accurate as of 2019-04-12 16:05:33 EDT and are subject to change. Any price and availability information displayed on http://www.amazon.com/ at the time of purchase will apply to the purchase of this product. The Studio Designs Triflex Drawing Standing and Drafting Table is modern, versatile, and practical. 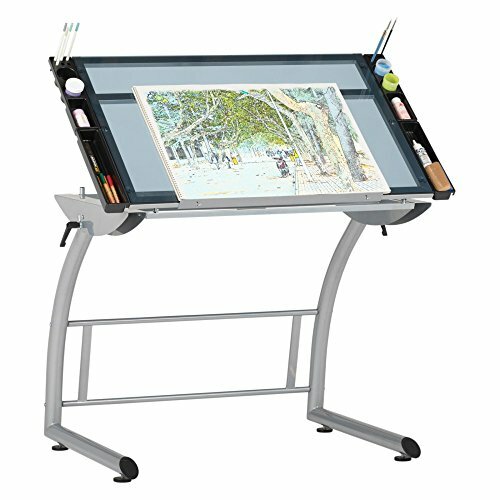 Its dual tilt design transforms it into a standing desk, and the side handles lock it into your preferred position. When you’re sitting, the tabletop tilts up to 68 degrees. Change it to a standing desk, and the tabletop can tilt up to 22 degrees. It’s ability to go almost vertical makes this desk an ideal art table for pencils or pastels. Four trays along the side are perfect for holding pens, brushes, and any other supplies that you need close at hand. 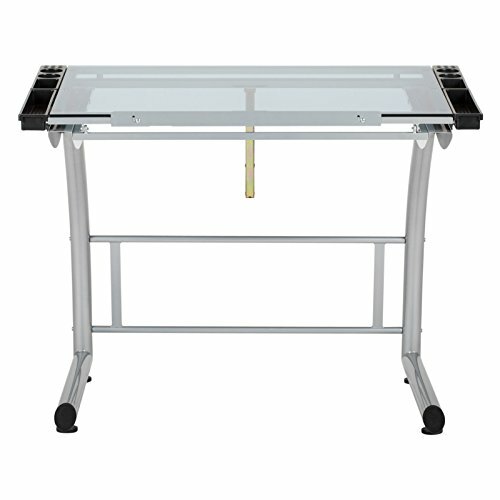 The glass top is easy to clean, and the silver powder-coated steel frame is made to last. 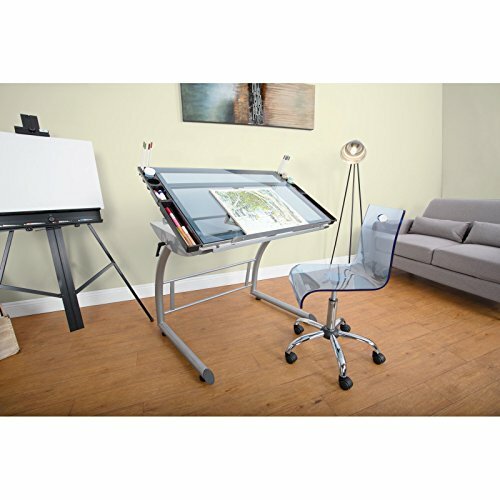 With its ability to be used as a writing, drafting, or standing desk, it will meet the whole family's needs. Dimensions Main glass top: 35.25W x 23.5D in. Sitting desk: 31H in. with 68° tilt Standing desk: 39.5H in. 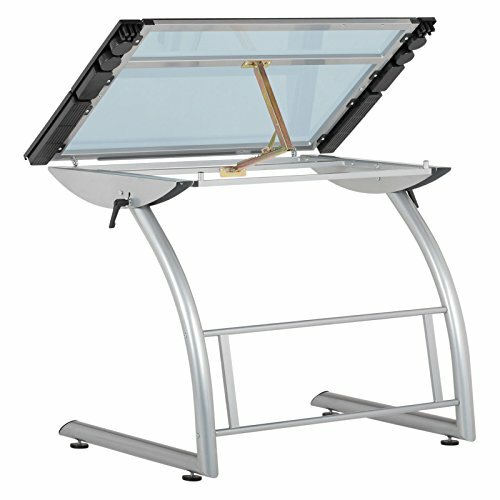 with 22° tilt Dimensions: 40.75W x 29D x 31-39.5H in.. Powder-coated steel frame and glass top. Silver and blue finish. Dual tilt design transforms desk to a standing desk. Side handles lock desk into preferred positions. 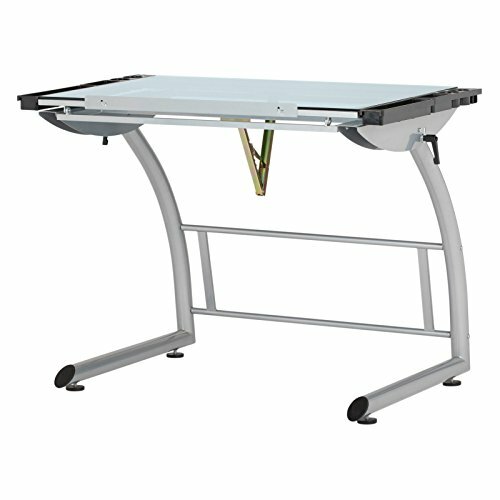 Tabletop tilts up to 22° in standing position, 68° in sitting position. Easy to clean. 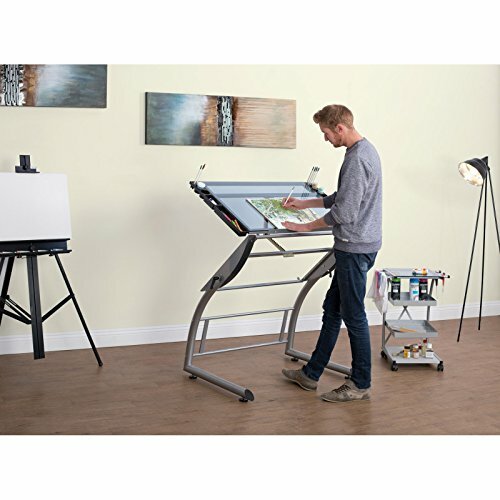 Use as a writing, drafting, or stand-up desk. 4 side trays for extra storage.